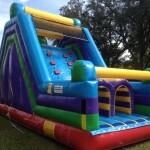 We have these inflatable dry slides available for rent today! The Edge is one of the largest dual lane dry slides in the industry! Great for fairs, festivals and events! 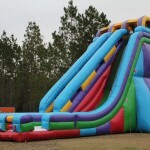 The Rock Climb Slide a great stand alone dry slide that stands 16ft tall and has dual lanes!